[b]A: [/b]Actually, even this update isn’t paid. The major part of this update (LCD screens, Replay Tool, new music tracks, smaller improvements) is free for everyone. Only the smaller and not mandatory part is paid - Decorative Pack. [b]A:[/b] The way we designed this is that even people who don’t purchase the Decorative Pack can play on servers with people who own the Decorative Pack. Players who don’t own the Decorative Pack won’t be able to build with these new blocks, nor interact with them, but they will be able to view them in-game. [b]A:[/b] To support future development of Space Engineers and other leading-edge projects we plan to work on at Keen Software House. 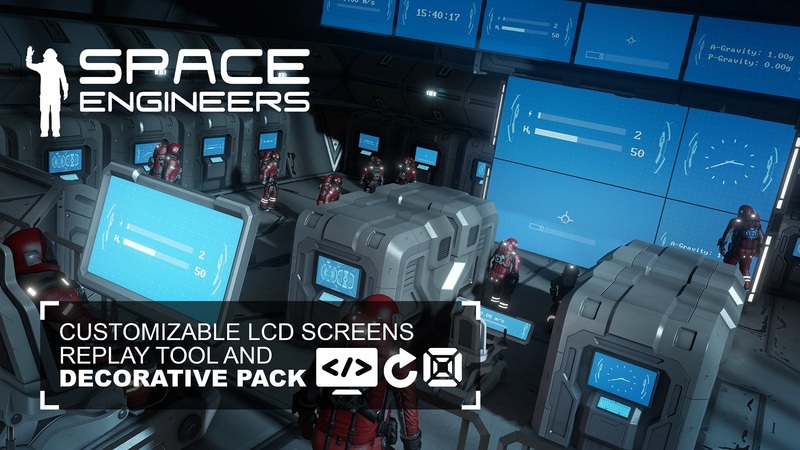 Players kept asking us for something they could buy to support the development of Space Engineers, and the Decorative Pack is a great option for them. [b]A:[/b] Right after Space Engineers left early access and all hot issues were resolved. Most of the work was done by the Art team, the rest of the developers is working on other long-term updates. [b]Q: Why haven’t you increased the price of Space Engineers and include the Decorative Pack in it, or why it’s not part of the Deluxe Edition? [b]A: [/b]We want more people to play Space Engineers, which means we must lower the barrier of entry. When the Space Engineers community grows, everyone benefits from this - more content on Workshop, more mods, more new ideas, more people to play with. This means that all non-mandatory features should be optional, so only those who really want them can pay for them. That’s why we decreased the price of Space Engineers, and made the Decorative Pack an optional purchase. [b]Q: We asked you for volumetric water, compound blocks, new goals, more optimizations, etc, and instead you are giving us a toilet block? [b]A: [/b]Hehe, if you put it this way, it sounds kind of funny. :) But the reality is that decorative blocks are low-hanging fruit, not a bottleneck towards those other mentioned future features. Additionally, the decorative pack can bring added profit and make the mentioned things happen.